Did you know that thousands of pets drown each year in swimming pools? Pets are a part of the family and need protection too! Most pet owners assume that their dogs know how to swim, many do, but some don’t. Some dogs that can swim, will panic if they don’t know how to get out. Sometimes, they can be just feet away from the steps but are unable to realize it, and eventually give up. 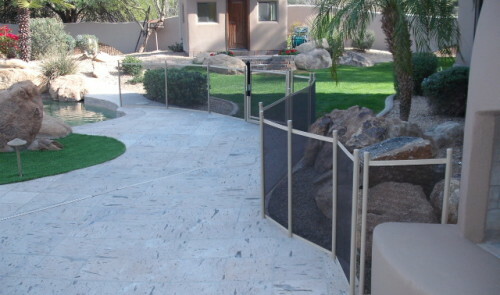 Protect your dogs, cats, or other animals from the swimming pool with a pet pool fence! Be aware of your dog’s swimming proficiency. Realize that this proficiency will diminish dramatically at night, with advancing age, and the fear associated with accidental falls. Even excellent swimmers may panic in the dark or after a slip and fall into the water. Understand that even dogs that swim are still at risk of falling in by accident, and may not be able to find their way out. Dogs with seizure disorders are never safe around water when unsupervised. If your dog is blind, they are at a very high risk for falling in the pool.